Most youth sports coaches are unprepared for their position. Studiesshow that only 5-10% of youth sport coaches have received any relevant training1. We know most coaches sign up because their own child is on the team and no one else volunteered. The next thing they know it is the first day of practice and they have a whistle and clipboard – but no formal training. Why does this matter? Why be concerned about providing coaching education or certification to coaches? Increase the amount of people interested in coaching. 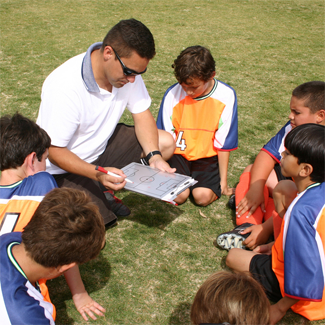 Training potential volunteers through a quality program, like the National Youth Sports Coaches Association, can give them confidence to participate in your program as a coach. If you have parents in your program that are hesitant to volunteer to coach, training often provides answers to concerns holding them back, like how to organize a practice, how to deal with parents or how to work with young kids, etc. So knowing that training is available makes them more likely to step forward to assist. Incorporating a coach training program into a sports season is not a daunting task. Leagues, multi-sport associations, municipal recreation departments and other youth organizations have the ability to establish a Chapter of the National Alliance for Youth Sports to offer its coach training program through the National Youth Sports Coaches Association (NYSCA). The NYSCA Online Clinic for coaches can be accessed within 24 hours of establishing a chapter and live coaching clinics can be hosted by your organization in as little as one week. Explore www.NAYS.org to learn more about the NYSCA program and the benefits of starting a Chapter for your organization.